The Yellow Vest movement in France was triggered by a tiny increase in gasoline taxes, but it actually is a more fundamental revolt against some of the main social and economic trends striking the West as a whole. Driving the news: The uprisings have spread to Belgium and the Netherlands (above), reflecting discontent with economics that bypass large swaths of the population, often living outside of the biggest cities. In France, Yellow Vests have widened their protests to include blockading a rural mall that has taken away business from Main Street, and overrunning a private tollbooth on a public road, reports the NYT's Michael Kimmelman. In an exceptional profile of the situation, Kimmelman crystalizes the French crisis as one of mobility: people have trouble physically getting to work unless they have a car because public transportation has been cut back, and their social mobility has been reduced by the way the economy has developed. "It is a crisis of dignity. It's a pride movement," said Celia Belin, a fellow with Brookings, speaking to Axios by phone from Paris. "There used to be the equivalent of the American Dream — the French Dream, based on a meritocracy allowing everyone to rise," she said. "But the French Dream has been shattered. Good morning, this year marks the 45th anniversary of the establishment of diplomatic ties between China and Spain. In a few days, President Xi Jinping will make a formal visit to Spain, which will inject new momentum and China-Spain bilateral relationship will enter a new chapter. Now is an ideal time for us to be gathered here for this conference, which focuses on China's reform and opening-up and the China-EU bilateral relationship. On behalf of the Publicity Department of the Communist Party of China Central Committee and the State Council Information Office, I sincerely wish this conference great success, and I welcome you all. The China-EU relationship is one of the most important bilateral relationships in the world. It not only affects mutual development but also influences the global political and economic landscape. Since 2000, China-EU relations have been promoted from a partnership to a comprehensive partnership and then to a comprehensive strategic partnership. In 2014, President Xi Jinping proposed building four bridges between China and the European Union – peace, growth, reform and civilization – as well as a China-EU comprehensive strategic partnership with global impact. President Xi's remarks pointed the direction for future bilateral relations. In the past 40 years of reform and opening-up, especially since the CPC's 18th National Congress in 2012, the CPC has led the entire nation in working together and has written a new chapter in Chinese history. Great changes have taken place in China, and socialism with Chinese characteristics has entered a new era. From 1978 to 2017, China's average annual GDP was 9.5 percent, and our country has become the second-largest economy in the world. Since 2012, China has contributed 30 percent of global economic growth. During this process, China has not only developed itself but also contributed to the world in different ways. China advocates and pushes for openness globally, and it is an important engine of global economic development, a vibrant market for world investment, and a contributor to world political reform. I would like to share some of my views with you. First, China will stick with reform and opening-up, and is devoted to an open global economy. In the past 40 years, China has achieved huge economic growth and contributed to global economic growth. President Xi said, "China's door will never be closed. It will only open wider. China will not stop its efforts to pursue higher-quality opening-up. China will not stop its efforts to pursue an open world economy." 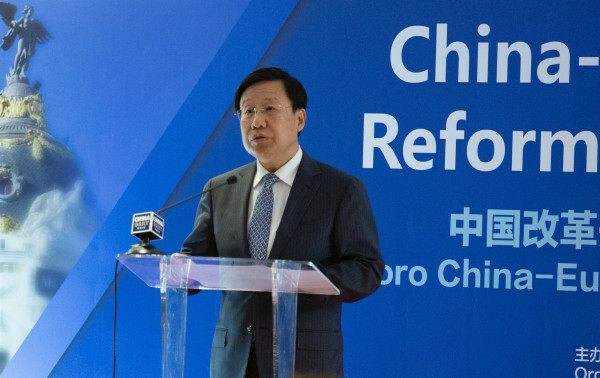 Not long ago, Shanghai hosted the first China International Import Expo, the world's first national-level import expo and an innovation in global trade. The EU is China's biggest trading partner. The total import volume from EU countries was $205.2 billion from January to September this year. Business elites from the EU have complimented China's policies of openness, which stand in stark contrast to anti-globalization and trade protectionism. China's pursuit of a new round of high-level opening-up welcomes countries from Europe and around the world to seize the opportunity to develop, realize mutual prosperity and build an open global economy together. Second, China's proposal to build a community with a shared future for mankind has pointed the direction for future world development and been widely acknowledged. The theme of peace and development has not changed, but there are many challenges including trade protectionism, unilateralism, terrorism, cybersecurity and climate change. What's going on? How can we deal with the challenges? President Xi has proposed building a community with a shared future for mankind, as well as a peaceful, safe, prosperous, open and beautiful world. This proposal has won applause from the international community and been written into United Nations documents. China and Europe are two big stages and two important pillars for building a community with a shared future for mankind. Enhancing China-EU dialogues and cooperation is vital to sustaining world peace and prosperity, and to ensuring global systems and the world order are rational, reasonable and fair. Both parties should recognize the challenges we face together and master the logic of world development. In addition, we should uphold international rules, stick to multilateralism, deal with common challenges, and strive to be a model of cooperation through inclusiveness, mutual learning, mutual benefits and win-win cooperation. Third, the Belt and Road Initiative has developed concrete projects and is providing broader opportunities for China-EU cooperation. President Xi first proposed the initiative in 2013, and in the past five years China has signed documents with more than 140 countries and international organizations. The BRI and its core concepts have also been written into the documents of world organizations including the UN, G20 and APEC. The trade volume between China and countries along the Belt and Road has reached $5.5 trillion, while 82 overseas trade and economic cooperation zones have been built. Meanwhile, China has invested a total of $28.9 billion, and 244,000 jobs have been created. 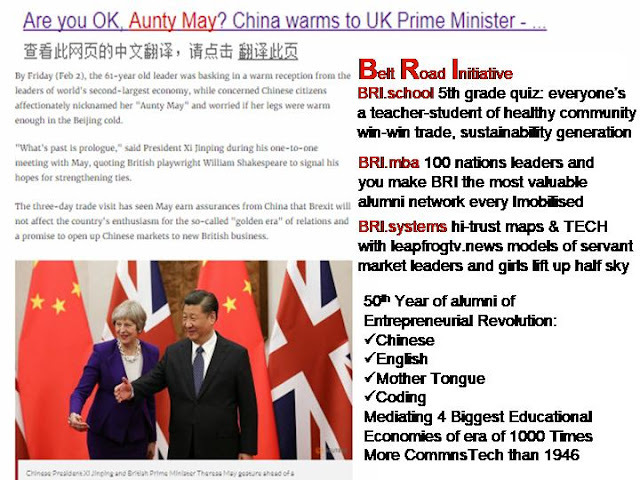 The BRI has gradually developed from a vision into a reality, and has been recognized as a "great new story of the 21st century". China has signed documents on BRI cooperation with 11 EU countries. China-Europe freight trains have made over 10,000 trips, arriving at 43 cities in 15 European countries. Take Spain for example, through China-Europe freight trains, exports from Spain to Yiwu in East China's Zhejiang province increased from less than $1.6 million in 2014 to more than $10.1 million in 2017. China and Europe lay at the eastern and western ends of the Belt and Road, and both parties should broaden cooperation channels, build new models for economic growth, cooperation, governance and development, and share the benefits of greater connectivity in Eurasia. This year is the 15th anniversary of the establishment of the China-EU comprehensive strategic partnership. China and the EU are experiencing a reform process that has never been seen in the history of mankind. Both parties will be each other's growth partner, development opportunity and reform reference. Guests here have rich experience and profound insights into world politics and the global economy. I believe you can look on China's reform and opening-up and the China-EU relationship with a global and historical vision to put forward measures to safeguard globalization and perfect international governance, contributing your wisdom and thoughts to develop the China-EU comprehensive strategic partnership in the new era. Once again, I sincerely wish this conference great success. Thank you all.